Perhaps mortality focused his energies and his resolve, and he came through like he said he would. Perhaps he didn't want a legacy of killing health care for millions as he approaches his own battle with an aggressive brain cancer. Two votes were called just after midnight. The first was a Democratic motion to refer the "skinny repeal" back to committee. It failed. The second vote was to pass the "skinny repeal." 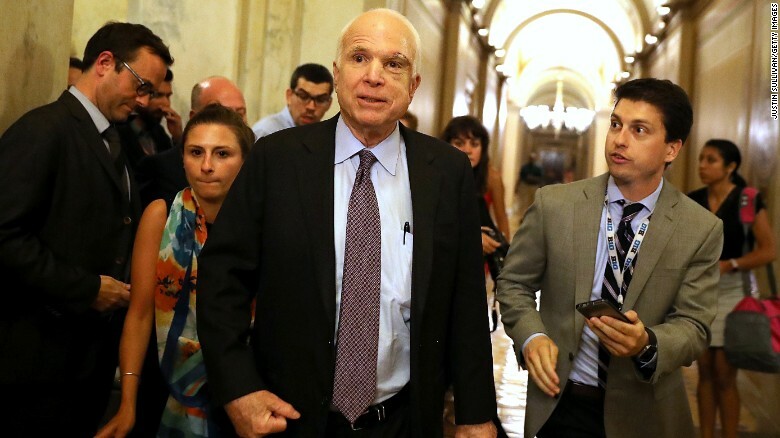 If you were watching, you know that the second vote prompted a full-court press by Republican brass on Senator John McCain. McCain was seated next to Sen. Lindsay Graham who had derided the "skinny repeal" earlier in the day as a fraud but who had decided to vote for it anyway because he thought he had a promise from House Speaker Paul Ryan that it would never become law. Hell of a way to govern: "I'm voting for this law because I know it'll never become law." Lisa Murkowski, one of the three no votes, approached McCain who smiled up at her and gave her a thumbs-down. Susan Collins joined the conversation. All three no votes were now talking. 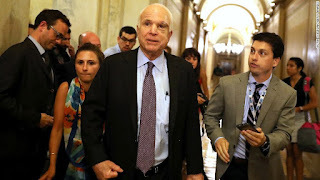 From the well of the chamber, Majority Leader McConnell dispatched the other Arizona senator Jeff Flake to lobby McCain. McCain wouldn't look at him and continued talking to Murkowski and Collins. According to reporter Ed O'Keefe, "That left Flake, one of the most polite members of the Senate, leaning into the conversation uncomfortably with a pained look on his face, as if he had to tell his father that he had run over the family dog with his car." Seeing that Flake was getting nowhere, Vice President Mike Pence joined the conversation, and for 21 minutes he cajoled McCain, Murkowski, and Collins until he was pulled away for a phone call from the White House. At 1:10 a.m. McCain crossed the Senate chamber and talked to Chuck Schumer and other Democrats. Sen. Dianne Feinstein gave him a big hug. As the vote on passage began, McCain was again off the floor talking to V.P. Pence, but he returned at 1:29 a.m. and delivered his no vote to the clerk. There were audible gasps in the chamber. Wonder how his best friend Lindsay Graham feels this morning, having witnessed an actual act of courage last night.